“Two days before Thanksgiving most families were scurrying around getting ready for the holiday, a time in which families gather to celebrate. 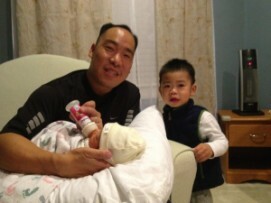 Our neighbor, Anna So, was on her way to the hospital that Tuesday morning to deliver her second child, a boy, to be named Jake. Pictures were posted on Facebook, by dad, Josh, showing the delivery room and their older son, Ryan, so excited to become a big brother (at the ripe age of 3). Such an exciting time for a family and their Dublin neighbors, who were sharing their joy at their family’s expansion. But that evening our neighborhood was hit with the blow that Anna had tragically passed away during the birth of baby Jake. Jake had a rough start, struggling to take that first breath and was taken to UCSF for further intensive care. Josh kept all of us updated daily via Facebook, as we all felt helpless as we watched Josh do his best for Ryan and Jake, knowing he just lost his wife and the mother of his two boys. Jake came home Tuesday, seven days after he was born. Such a miracle after such devastation. Our Dublin Ranch Gleneagles community is an especially unique one. To say we are neighbors is so impersonal. To many of us, this community is our family. At the very least, we are all friends. When something this tragic strikes, such as that which happened to the So family, we cannot help but to have the overwhelming desire to help in any way we can find. Some made signs to welcome baby Jake, some have set up an online meal calendar, some moms are continuing the preschool research for Josh (which Anna was doing) and some are looking to make a monetary donation to the So family to help with funeral expenses. Anna will be laid to rest this Saturday at a private ceremony in Livermore. If you are interested in supporting the So family in some capacity, please email us at donations@thebstarproject.org with the subject line “The So Family”. The leaves are turning colors and the air is beginning to get nippy. Soon the rain clouds will be upon us and hundreds of children living in shelters or on the streets will be soaked walking to and from school. Please help make this difficult time a little less uncomfortable by donating a new or gently used umbrella to our Third Annual Umbrella Drive. Each year, The B* Project collects and donates 300+ umbrellas to local shelters and community service locations. The umbrellas are given to school-aged children to help make walking to and from school less grueling in harsh weather who may or may not have warm jackets or raincoats. Aside from keeping them dry, the colorful umbrellas put instant smiles on the faces of these kids. Working parents who do most of their traveling by foot or public transit, also receive donated umbrellas. These parents are already experiencing a significant hardship and are attempting to get back on track. These donated umbrellas enable these parents to get to work more easily in unfavorable weather conditions. Unable to donate umbrellas? Want to do MORE? Help spread the word or help collect umbrellas at your work or local school. 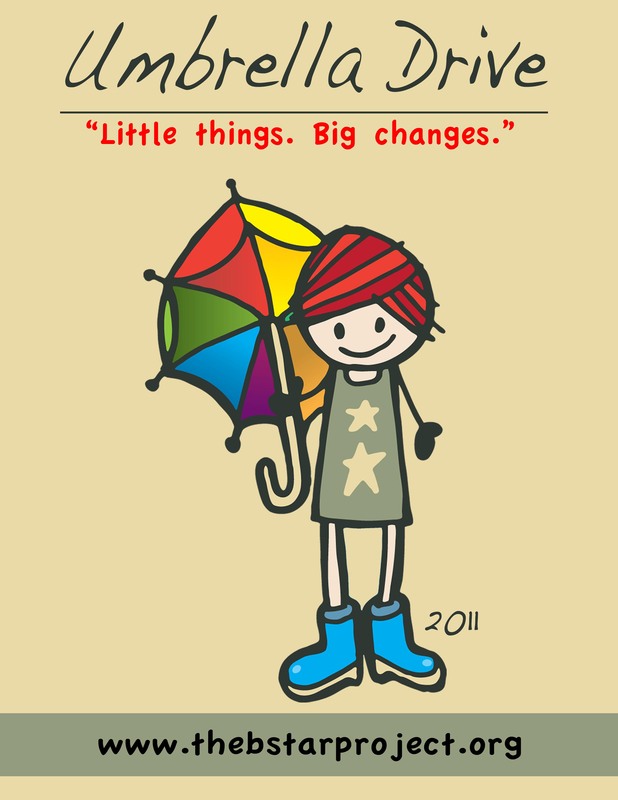 For more information about the Umbrella Drive, e-mail umbrellas@thebstarproject.org or call (925) 388-6890 for more information. Trick or Treat! Now what? So it’s four days after Halloween and some of us are wondering what we should do with the seemingly endless heap of candy in our midsts. We’ve heard all kinds of strategies — giving leftover candy to charity, buying the candy from our children or trading it up for a toy. Some of us let the kids go hog wild until it’s gone. Others carefully dole it out throughout the year. Sociologist, Dr. Dina Rose offers up a handful of strategies on how we can, over time, learn how to reduce our role in the candy-control struggle that presents itself each halloween, and throughout the year. She also breaks down the unintended messages we are giving our children when we play the role of Candy Controller. Dr. Rose, of It’s Not About Nutrition runs a blog on The Art & Science of Teaching Kids to Eat Right. She proposes that by giving halloween candy away, parents are missing some valuable teaching moments. By overly controlling our kids’ consumption of sweets we are effectively robbing them of opportunities to learn self control. 2. 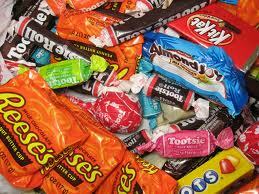 Encourage Your Kids to Taste Test so that the halloween bag becomes an avenue for risk taking and trying new things. 3. Teach Your Kids to Think BIG whereby they can start to practice and understand how to keep inferior foods in their proper proportion. To read much more about her strategies for dealing with your kids candy haul check out her article, But What Are You Going to Do With All That Halloween Candy?. To hear more about why we should think twice before giving all that candy away check out her articleThe How-to Control-Your-Kids’-Candy-Consumption Con. People don’t usually associate Sunnyvale with poverty or people in need, but sadly, they should. United Way Silicon Valley identified Sunnyvale as one of the two fastest growing poverty areas in the county. 27% of the city’s 140,000 population falls equally into extremely low, very low, and just plain low income categories using national standards not adjusted for our higher cost of living. Second Harvest Food Bank identified a Sunnyvale zip code, since divided into two, as among the ten neediest in the county in terms of hunger and food insecurity (not having enough food throughout the month). Over 40% of Sunnyvale School District’s students qualify for free or reduced price meals. For volunteering opportunities or more information about Sunnyvale community services, email us at volunteers@thebstarproject.org. As the summer begins to wind down, children of all ages will be headed back to school. It happens every year- parents will ravage malls and stores everywhere to complete the annual tradition of back-to-school shopping. Hundreds of dollars in new clothes, shoes, and school supplies will be purchased this month bankrupting wallets and polluting our planet’s resources. Is a package of 68 pens that smell like fruit really necessary? The average school tosses 38 tons of paper out- that is equivalent to 644 trees- each year. Although it is important to be prepared, it is equally important to try and be as green as possible. Yes, even when doing back-to-school shopping. Purchasing post-consumer paper and ensuring that paper also gets recycled can make a big difference. 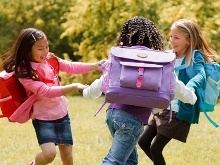 Read on + learn how TreeHugger.com advises all of us to be more green when sending the kids back to school. Get off to a Good Green Start Plan out your day (and your year) at school, and ask yourself some questions. Are they really going to ride that new bike enough to warrant a new set of wheels? Is another reusable lunch bag or canister really necessary? Do they really need a new ruler? The measurements haven’t changed over the summer. Make a list of what you absolutely know they need, what you think they might need, and what they want. Take Inventory and Avoid Duplicates Take a careful inventory of what you already have that can be used again — think more durable items, like clothes and shoes — and what’s still waiting to be used for the first time — extra packs of pencils, notebooks, etc. 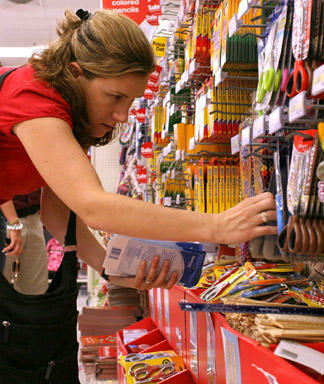 Avoid last-minute impulse purchases by making a list of what you need and sticking to it. before you head to the store. Find Green Clothes Almost half of the money spent on back to school shopping goes to buying clothes, but new threads don’t have to come with sticker shock. Hand-me-downs are a great place to get started, and thrift stores and events like Swap-o-Rama-Rama can be a fun and an inexpensive way to send your kiddos back to school in low-impact duds. If these options are exhausted before your list is done, and you have to buy new, go for well-made, high-quality choices made from more sustainable fabrics like organic cotton or bamboo rather than disposable fashion that’ll wear out. Choose Greener Pens and Pencils The days of package upon package of disposable pen and pencil are gone, replaced by biodegradable pencils, refillable pens, and recycled versions of both. Once you have greener options in hand, encourage your youngsters to hang on to each pencil ’til it wears down to the nub, and to each pen as long as possible. Don’t be a Paper Pusher Buy products with the highest percentage of post-consumer recycled content possible, that is processed chlorine free (PCF). Next, use these products to their maximum efficiency by printing on both sides of the paper, using paper already printed on one side for drafts (or better yet editing all drafts in the computer itself), and filling notebooks from cover to cover before purchasing a new one. And it never hurts to ask teachers if you can email in your work. Beware the Miscellaneous Supply Overload Don’t be tempted by the better deal on a dozen bottles of glue if you know you’ll only need three bottles between now and next spring. If it doesn’t have to come out of the backpack every day (or it is a backpack), think twice about loading up at the beginning of the year. Think Outside the Lunch-Box Don’t brown bag it; instead opt for a washable, reusable container to tote your lunch too and fro. Just make sure to avoid vinyl lunch boxes which have been shown to contain harmful levels of lead. Instead, invest in a PVC-free, thermally insulated lunch bag, one made from recycled juice boxes or from organic cotton and keep lunches cool by freezing water or juice in a reusable container and putting it in the bag. Instead of using baggies and plastic wrap for sandwiches and snacks, use reusable plastic containers. For other beverages, beware of plastic bottles which may contain Bisphenol A (BPA), a hormone-disrupting chemical. Instead go with metal ones. Don’t Start a Food Fight When it comes to the actual food that goes in the lunch box. Make extra for dinner the night before, leftovers make great lunches. Pack healthy green lunches kids will want to eat, and get them involved in choosing lunch ingredients, since they’ll be less likely to pitch stuff they want to eat. Forget the mini-packs of Cheetos and Doritos; apples, oranges, bananas, and other fruit are heathful, waste-free snackables that come with their own compostable wrapping. And, don’t forget: Kids need snacks as well as lunch. Make homemade granola bars rather than individually wrapped purchased bars. Or send them with fruit or vegetable sticks and a couple of slices of cheese. Walking, Biking, Busing: Green Transportation to School Going green while getting back and forth to school offers a familiar refrain: human power — walking or biking — is best; riding the bus is next; driving alone is last. Events like Walk to School Month and activities like the Walking Bus are making it easier and safer for kids to get to school under their own power; if you don’t live close enough to walk, and finding a safe route to bike ride is a green way to go, too. Beyond that, even though most school buses get single-digit miles per gallon, they can also hold upwards of 60 or 70 youngsters, making them a cleaner option than single-occupancy cars. If walking, biking, or busing aren’t in the cards, be sure to divide the ride and start a parent carpool. 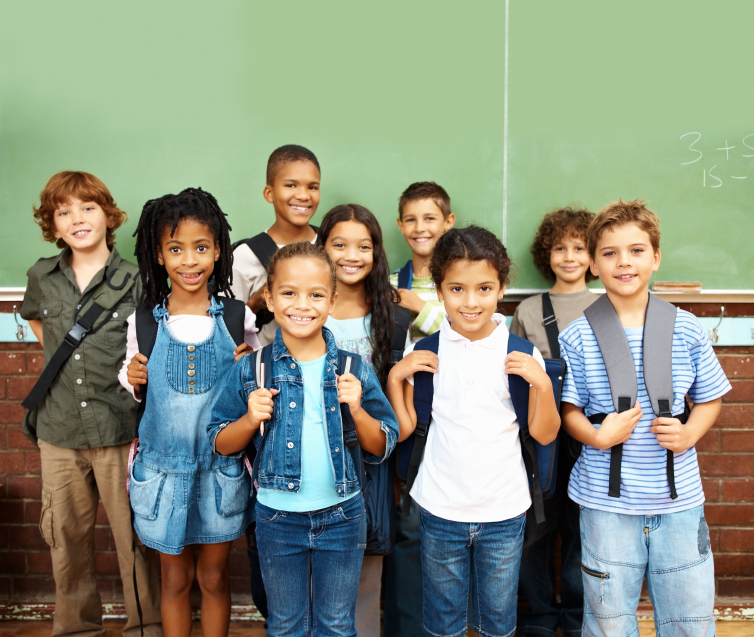 Do This Stuff All Year Greening your back to school experience is a great way to start the year, and a great way to make progress toward a sustainable lifestyle, but there’s no reason to stop after the year has just started. Apply the lessons you’ve learned preparing to go back to school to other parts of your non-scholastic life, and, when it comes time to re-supply, follow the tips to stay prepared, organized, and green. Having the weight of the world on your shoulders is generally considered a burden. Unless you’re carrying it in a Schoolbags for Kids backpack. Then it’s a privilege and an honor. That’s because for every tote you buy from the newly launched company, the founders donate a pack full of school supplies to a child in Belize, India, or Thailand. The schoolbags have a neat horizontal design that allows books, art projects, and even a laptop (welcome to elementary school in the new millennium) to be stowed in an orderly fashion. Interior pockets hold pencils and markers; there’s an exterior mesh pouch for kiddo’s water bottle. Worried about the heft? Wide, cushioned straps distribute the weight in a safe, comfortable way. There’s power in sharing the load. Available online at www.schoolbagsforkids.com, $55. It is time for our annual Backpack Drive! We are looking for Good Deed volunteers to help pack + distribute backpacks in August as well as donate any school supplies (see list below). Please call, message, or e-mail us at donations@thebstarproject.org for more info.